To veil or not to veil…The wedding veil guide. When it comes to the brides outfit the dress is the most important thing. But once they’ve found the perfect dress what about the accessories to go with their outfit. There are many different types of veils to choose from as well as modern alternatives for a bride to choose. But do we actually know the tradition of a veil and why is it still worn today? There are various different reasons as to why people think a bride wears a veils on their wedding day. In the 19th century the wedding veil was to symbolize the bride’s virginity and modesty. It was traditional for the brides face to be veiled until after the conclusion of the wedding ceremony. Where the fathers bride would lift the veil when giving the bride to the groom. Or the groom will lift the veil which symbolizes the groom’s right to enter into conjugal relations with his bride. It was also said that a veil was to protect the bride from evil spirits on her big day. And in the past bridesmaid would often wear them to help disguise the bride making it harder for evil spirits to find her. Although some brides still wear veils today are they aren’t as traditional as they once were with brides opting for a more modern style. 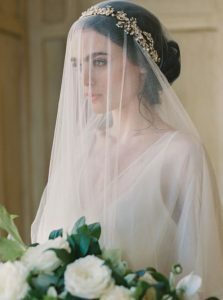 In modern weddings, the veil symbolizing a conjugal relation starting may not occur of the couple are already entered this relation prior to the wedding. Although this could still be the case in some relationships, dating someone is not as strict as it once was. Nothing screams traditional than a veil so if you are looking into wearing a veil for your wedding but feel spoilt for choice and not sure on which style to go with here are a few veils and a description of them. 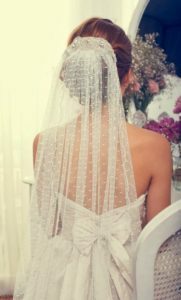 More of a vintage style of a veil, the birdcage veil is suitable for a bride who wants to wear a sort of veil but without the fuss of more a traditional one. Some are designed to reach the tip of the nose and some reach the edge of the chin. 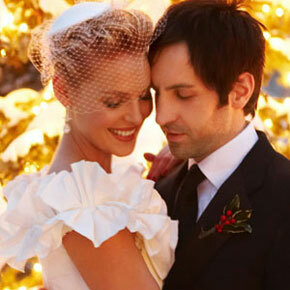 A celebrity who wore this more vintage style of veil on their big day is 27 dresses actress Katherine Heigl. This veil is a fun way to commit to a traditional veil but without having to worry to much about tripping over it. It’s a nice touch to the traditional veil but with a bit more of a modern twist. If want a longer veil without going to long then this maybe the one for you. With it just reaching down to your fingertips it’s the perfect veil for any bride wanting to be a tradition going. 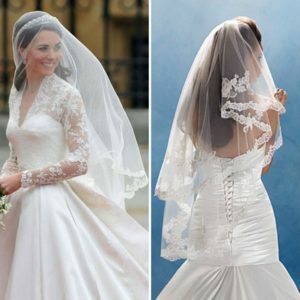 An example of a fingertip veil can be taken from the royal wedding of Prince William and Kate Middleton where she herself wore a fingertip veil. A waltz veil will fall between your fingertips and the floor but it’s the ideal length if you’re looking to take those wind swept pictures you see in the bridal magazines. It’s just longer than a fingertip veil and is a veil that if often chosen by a bride. If you want to go all out for your wedding day then the cathedral veil is the one for you. An example of a cathedral veil is Kim Kardashian veil to her marriage to Kanye West. Now when most people hear flower crowns they might think of summer. And a festival but this simple hair accessory could be the modern version of a veil for you. Buy a simple flower crown with colours from your scheme. Or use fresh flowers and ask your hair stylist on the day to create a crown with them. A celebrity who chose to go with a more modern veil for their wedding was Ashley Tisdale. 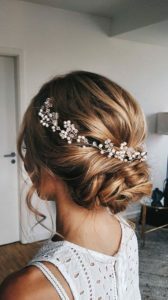 Very similar to a flower crown, a hair vine can be crown across the crown of the head but can also be worn wrapped within the hair depending on your hairstyle. They come in different lengths so depending on what you want to do with your hair depends on what length and style you would need. It’s said that your wedding day is one of the most important days of a woman’s life. And that on their wedding day they should feel like a princess. So why not make yourself feel and look more like a princess then by wearing tiara rather than veil. An example of how to wear a tiara on your wedding day without needing to be a princess is Victoria Beckham in her wedding to David. 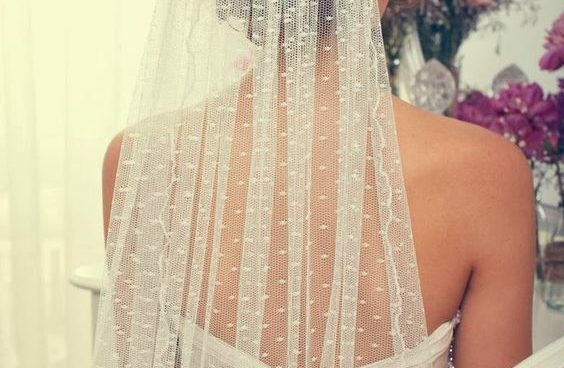 There are so many different variations of veils and now with the modern versions becoming more popular, there’s an option out there for every bride. Please share below in the comments what you have or are deciding to go with on your big day.